Well today is the final day of the election! 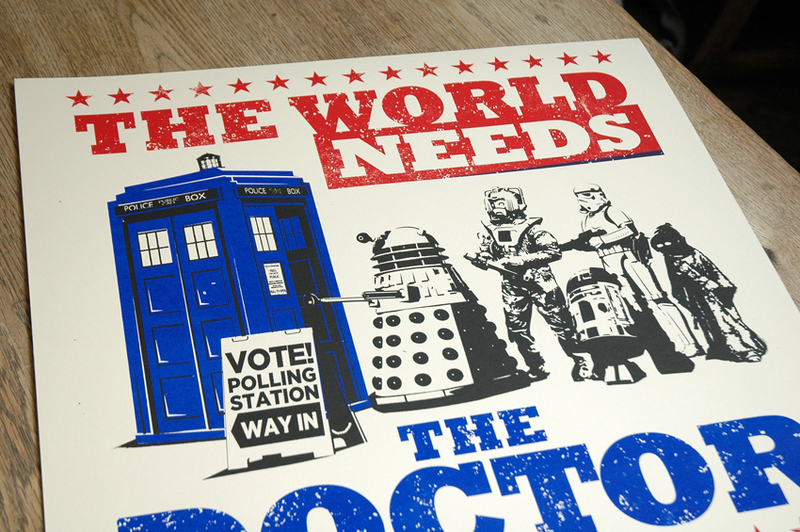 I live across the road from my local polling station so I thought as an alternative to putting up the usual political party posters in my window, I’d do something that was more my style…if only I could of voted for the Doctor! This 3 colour hand pulled screen print measures 50cm x 70cm (approx) and is printed on high quality acid free 220gsm Fabriano Rosaspina art stock which has a deckled edge on the bottom. Each print is signed & numbered and I’m only going to be printing 50 of these so once they’re gone they’re gone! Posted in Prints. 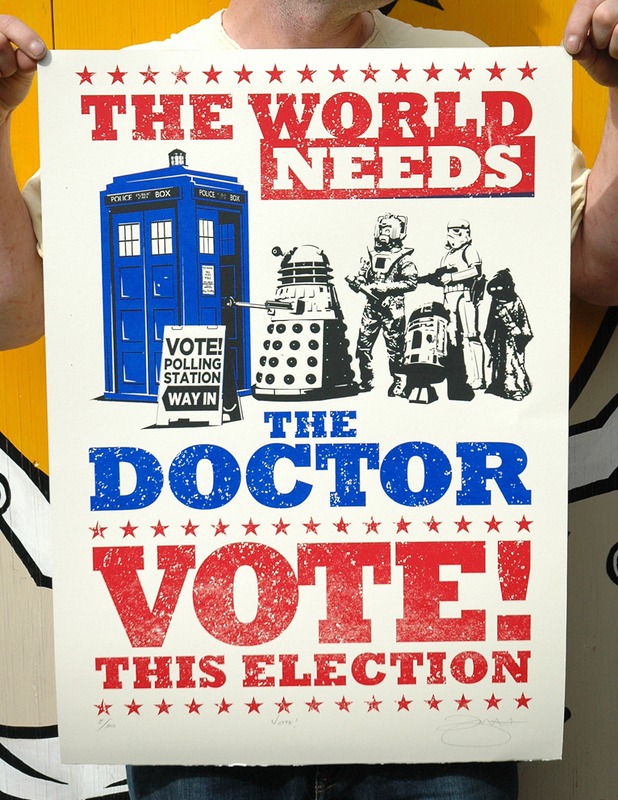 Tagged with Dr Who, Sci-fi, The Doctor, Vote. First new print of 2015, Cyber Shine! Well at last, a new print design!! 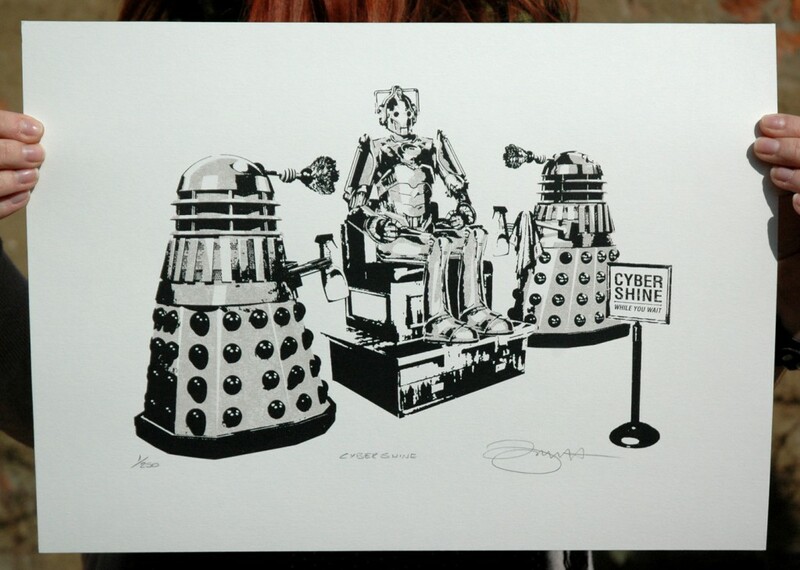 So if you’ve ever wondered how Cyber Men keep them selves all shiny? Well now you know! This 2 colour hand pulled screen print measures 32cm x 42cm (approx) and is printed on 315gsm Heritage acid free art stock. Each print is signed & numbered and is strictly limited to an edition of only 250 so once they’re gone they’re gone! Posted in Prints. 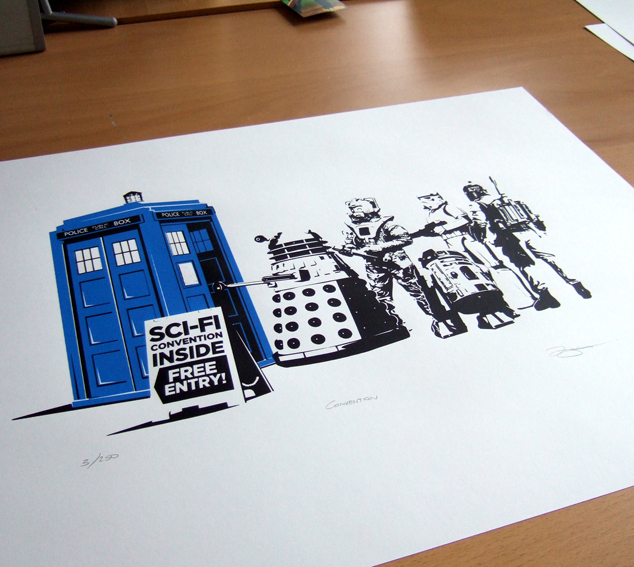 Tagged with Comedy, Cyber Man, Dr Who, Humour, Sci-fi, Science Fiction, Screen print, TV. In the past my art has mainly been inspired by either Star Wars or Star Trek but I’ve recently started watching Dr Who again, since it was re-booted, and my favourite incarnation so far has been David Tennant. 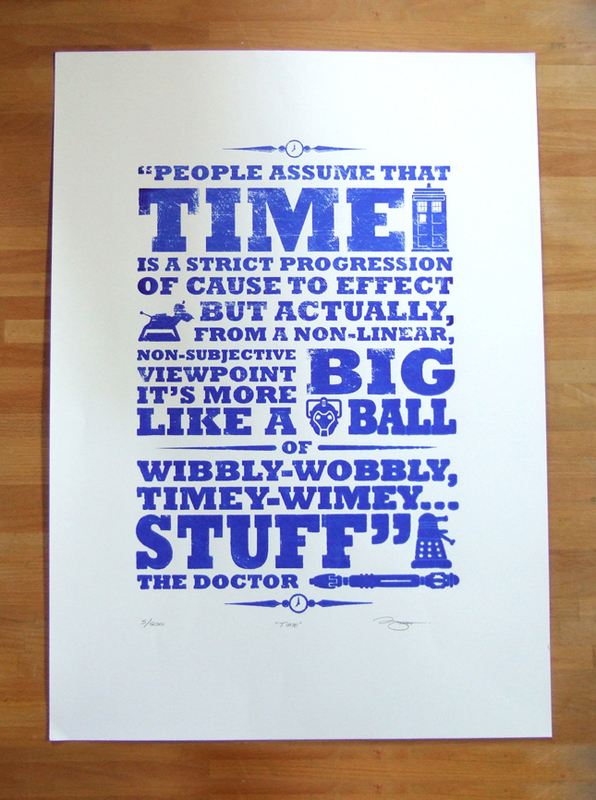 I came across this great quote by the good doctor from the episode “Blink” which I think is from the third series and it inspired me to create this screen print. 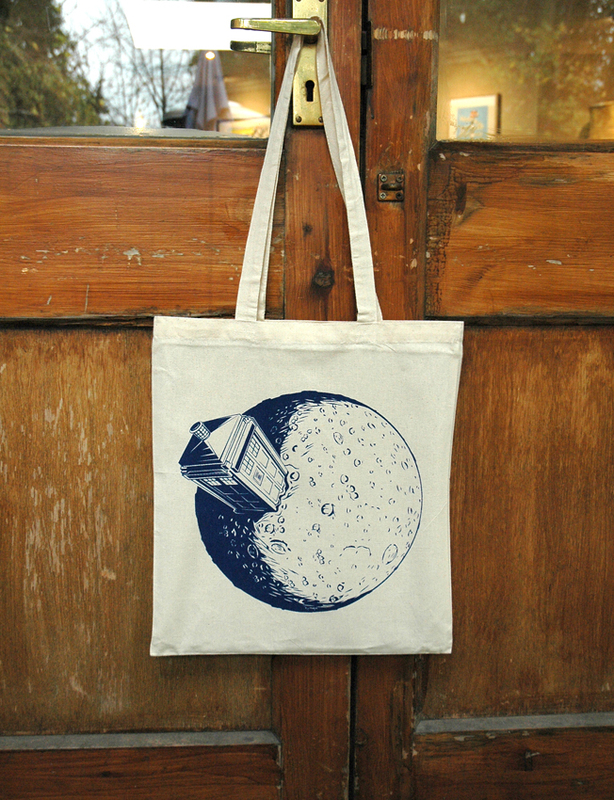 Each print measures 42cm x 59cm (approx) and is screen printed on high quality 200gsm art stock. 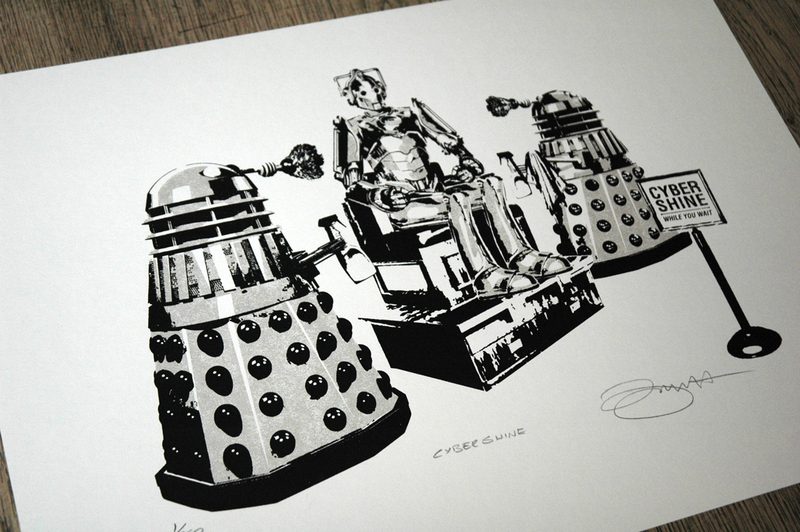 These signed & numbered prints are strictly limited to 500 copies, and are for sale at £25 each. Posted in Prints. 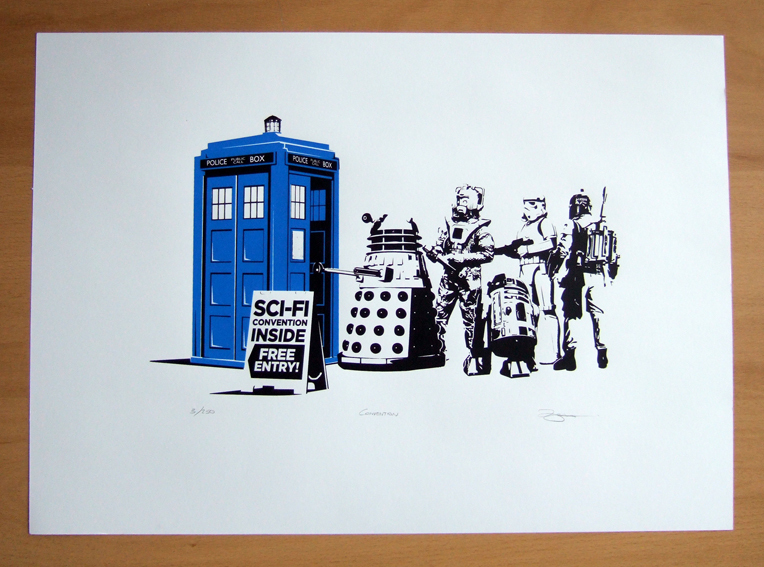 Tagged with Dr Who, Sci-fi, Timeloard.